3rd or 2nd century B.C. Burr, Terra-cottas from Myrina (MFA), no. 075. 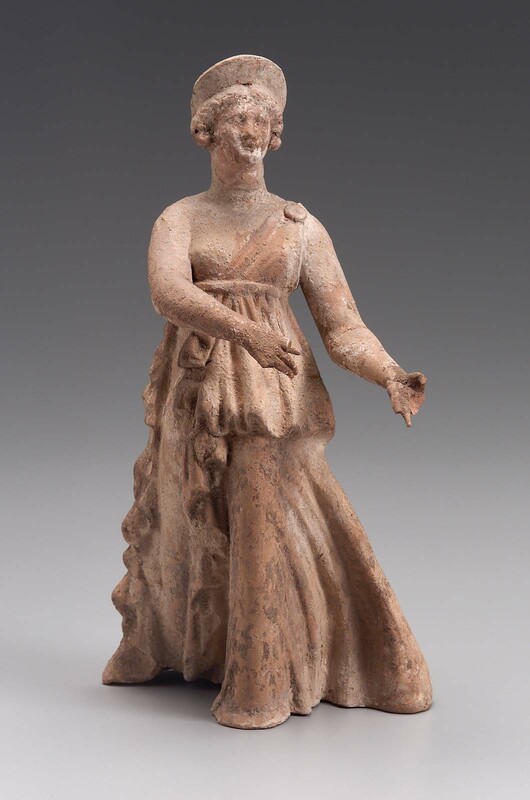 Statuette of a draped woman. She is standing with her left leg stepped forward. Her arms are extended to the left; she looks like she is dancing. She is dressed in a long chiton, with overfold open down to the right side and fastened on the left shoulder with a button. She has her hair tied behind and arranged in a row of curls above her forehead; she is wearing a crown (stephane) and earrings. This figure is dressed and posed as the group of flying Nikai from Myrina, but she doesn’t have any wings. She has a hang-hole on the back for suspension. Missing: feet, end of thumb, first two fingers and end of little fingers of left hand; first and fourth fingers of right hand. Traces of black on stephane.